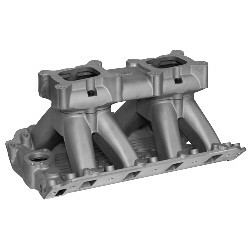 The Redline Intake manifold is designed to suit Holden 308 Red, Blue and Black Engines (VN heads). This manifold accepts 2 X 4bbl Squarebore Holley carburettors (designed for 4bbl Squarebore) - the perfect performance upgrade for your vehicle. Redline Performance manufactures quality performance products and our manifolds are cast locally in Sydney using Australian Aluminium. All our manifolds are designed to produce maximum torque and horsepower. This manifold has 8 bosses which can be drilled for fuel injection. Use the linkage kit part number 42-210 and 12-8 to bolt the carburettor to the manifold.